An initial proposal for a Statue of Autonomy for Galicia drafted by the Seminario de Estudos Galegos and based on the conception of Galicia as a free nation. The Seminar of Galician Studies presented a Preliminary plan for the Statue of Autonomy for Galicia, that had been made ​​by Valentín Paz Andrade, Lois Tobío, Ricardo Carbalho Calero and Vicente Risco. Alexandre Bóveda wrote an economic report that accompanied the proposal. The Preliminary plan for the Galician Statut presented by the Seminar of Galician Studies was published on May 6th, 1931. Consisted of 7 chapters and 41 articles. It started from the base of Spain as a federal and state and Galicia as a free state in their midst, and collected Galician as the official language. About the Galician State, territory and citizens. Section 2. The official languages in the Galician State are indistinctly either Galician or Castilian Spanish. People that do not speak the Galician language shall not be able to hold public posts. Section 3. The Galician national colours are blue and white. Section 4. The Galician territory is made up from the four old provinces of Coruña, Lugo, Pontevedra and Orense. Section 5. Any other neighbouring area can join the Galician territory, if two thirds of its electorate agree, and it is approved by the Galician State and the legislature that governs the territory in question; this must all have Federal Power endorsement. The plebiscite referred to in the first paragraph of this section shall take place by initiative of the Galician State Council or by that of the twentieth part of the country's electorate thar is trying to be annexed. Children of Galicians born in the Galician state territory. Children who have a Galician father or mother, even if they were born out of Galicia, as long as it is their wish. However if the children are minors, their wish shall be understood as that of their legal guardian. Those who were not originally Galician, but have earned their residency in any part of Galicia. Section 7. Those that are not Galician shall be subject to the real estate laws and civil rights that correspond to them under the Galician State's current provisions. Respect for personal property is governed by the owner's personal law. 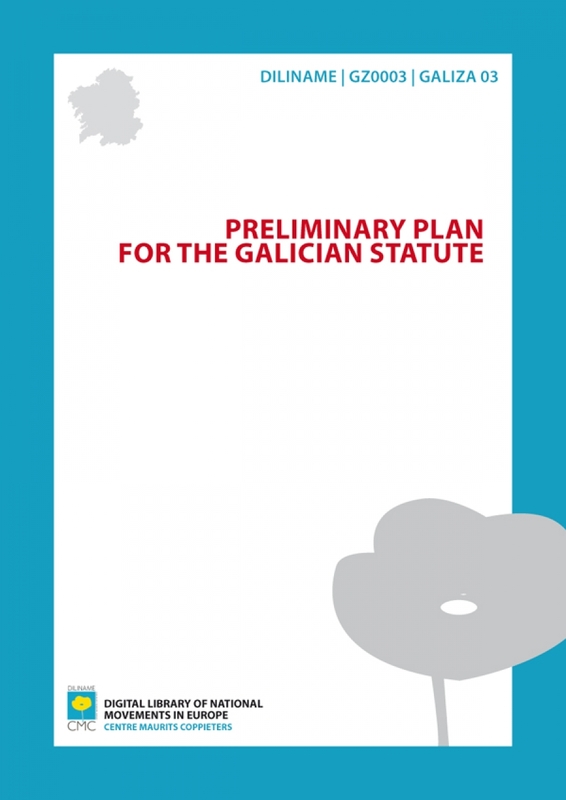 The Galician State's laws and provisions shall be governed by legal acts carried out in the Galician territory that are authorised by Galician State authorities or civil servants. Section 8. Fundamental rights for Galician people shall be those determined for all Spanish people as stated in the Federal Spanish State Constitution. Section 9. The Galician State's powers correspond to the Galician people. These powers are applied by the Electoral Body, the Assembly and the Galician Council. Section 10. They are made up from the electoral body of all Galician people, men and women, who are over 21 years of age, with the exceptions indicated by law. At a referendum or by popular demand. Section 12. The right to vote shall be the equal, direct, secret and shall follow the proportional representation system. Section 13. The Galician State Assembly shall be made up from the Galician electorate, in the proportion determined by Organic Law, taking into account the actual number of voters. Section 14. People that are eligible for the Assembly, as well as for other public positions, are Galicians, men or women who are over 23 years old, that can be useful to the community, with the exceptions indicated by law. Section 15. Assembly member renewal shall take place every four years. Section 16. The Assembly shall run continuously, according to the days stated in the Organic Law and with the holiday periods that this states. Section 17. The Assembly is in charge of legislating on matters assigned by this Statute or Galician Power. Section 18. The Assembly's representatives shall have parliamentary immunity, and shall not be able to hold, during their mandate other paid public posts than those of Council members. Section 19. All law voted on by the Assembly shall be put to a referendum, within thirty days after it is voted on, requiring at least five thousand voters. An articulated law project, presented to the Assembly with 10,000 signatures, obliges it to deliberate on it within a year. The agreement shall be submitted to a referendum. Section 20. The Galician Council shall be composed by councillors appointed amongst their members by the Assembly, in a number determined by the corresponding organic law. Each councillor shall be the head of a Galician administration department. Section 21. The Council shall elect a Chairman from amongst its members, whose duties as such, shall last for a year. The Council's chairman shall be the highest representative of the Galician Power and shall preside over the Council's meetings, direct debates and have the casting vote in case of a tie. Section 22. The Council shall act from the moment of its election at the first session of the following legislature after it was elected. The Council shall automatically stop its duties if there is a vote of no confidence approved by an absolute majority of the Assembly's members. Section 23. The post of councillor shall be paid and be voluntary. Execute the laws voted on by the Assembly. Manage public services in the Galician State. Convoke the Assembly and dissolve it after its term has elapsed, according to the laws. Act in dealing with the Federal Power, as a representative of Galician Power. Section 25. Councillors criminal responsibility for any common offences committed whilst occupying their posts, whether they be when carrying out their duties or not, shall be dealt with the Assembly’s previous authorisation, before the highest Court of Justice in the Galician State. Section 26. No appeal can be lodged at Central Government against resolutions by the Galician government in matters regarding their authority. Section 27. If the Galician government invades the limits of the Federal power or any other federate's jurisdiction, it shall be up to the Federal power to declare the nullity of the agreements that make up this transgression. Section 28. There shall be a right to appeal in the Galician administrative courts, against Galician authority resolutions that infringe rules that delimit their duties, and that are not contained in the previous article. The Galician States' areas of duties and obligations. Tax regime, except customs tax. Establishment of duty rates shall be verified by agreement before the Federal and Galician government. Command of the Police Force, whose organisation will be under the Central government's command. Social policy, without prejudice of general obligations. Railways, roads and maritime traffic that are of predominant Galician interest. Regulation of shows and games. To submit to general rules dictated by the Federal State within its functions. To guarantee work for all its citizens, according to their conditions and needs, according to social justice requirements. To regulate rural property in such a way that it shall be free of all charges for those that work it. Give all citizens the necessary means for their total spiritual development. Protect all Galician culture expressions. Section 31. Local organisation shall be made based on town and parish councils, together with the country parish associations. Local Galician organisation shall be a matter of law. Section 32. Every year the Assembly shall vote on the Galician State budget, as proposed by the Council. Section 33. The Galician State shall contribute to the Spanish Federations taxes with the amount set out in the Spanish States general budget law. This amount shall make up the first part of the Galician state's budget spending. Section 34. There shall be a sole direct tax on income, with a higher rate for income that comes from capital rather than from work, and exempting from tax income from low paid work according to the corresponding law. Section 35. There shall also be indirect taxes that shall be set up according to the laws. Section 36. Only aid and public credit shall be available through a law. Local entities shall be able to call on credit according to the laws. About the reform of this Statute. Section 37. Demand to reform this Statute shall require the same conditions as those demanded for an ordinary law. Section 38. So that a reform project of this Statute can be approved, the vote of three quarters of the Assembly's members and acceptance by the electoral body through a referendum is required. Section 39. This Statute shall come into force, considering Galician everyone who lives in Galicia and whose mother or father was born in Galicia, and those that live in Galicia but whose parents are not Galician, but show that this is their wish. The children of Galicians born out of Galicia shall also be considered Galician if they so wish. Section 40. The civil servants that when this Statute comes into force, carry out their duties in Galicia, shall keep their positions that shall be adapted to the new administrative structure, as long as they are Galician according to section 39, and meet the other requirements needed. Section 41. The corresponding part of the Spanish State's current public debt should be determined by an agreement with the Spanish State and the Galician State.